THE National Railways of Zimbabwe (NRZ) has increased freedom train fares on its City-Cowdray Park route from 50 cents to $1 while its multiple ride budget ticket will go up from $4, 50 to $9 starting on Monday. 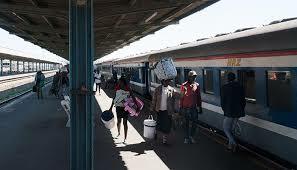 NRZ public relations manager Mr Nyasha Maravanyika said the parastatal increased single rides for adults and students at tertiary institutions to $1. Children and pupils will continue paying 50 cents. “Starting from Monday February 4, there will be separate fares for children and adults. Single rides fares for adults will go up from 50 cents to $1.Children and school children in uniform will continue paying 50 cents,” he said. Mr Maravanyika said the multiple ride budget ticket has gone up to $9 from $4,50. The multiple ride budget ticket is valid for 10 trips. The NRZ reintroduced the commuter train service in November last year and all fares were pegged at 50 cents per ride for all passengers, irrespective of age. Mr Maravanyika said the adjustment in fares has been necessitated by rising operational expenses. “NRZ has not been spared by the increase in operational expenses hence we have increased our fares. Our income was not balancing with the expenditure so this is a way to avoid operating at a loss,” he said. Mr Maravanyika said NRZ had been ‘sacrificing’ its services for the sake of commuters. “We have a duty to provide transport services to the people that is why we sacrificed even though we were making a loss. Now we have moved on to increase so that we survive the economic pressures,” he said. Mr Maravanyika said the freedom train was complementing other transport operators.